to redeem a world riven by race, power, and money. The Foreigner’s Home explores Toni Morrison’s artistic and intellectual vision through “The Foreigner’s Home,” her 2006 exhibition at the Louvre. Through exclusive footage of Morrison in dialogue with artists, along with extensive archival footage, music, and animation, the film presents a series of candid and incisive exchanges about race, identity, “foreignness,” and art’s redemptive power. In “The Foreigner’s Home”, her 2006 exhibition, Toni Morrison drew connections among diverse figures, works, and events—from painter Theodore Gericault’s The Raft of the Medusa to filmmaker Charles Burnett’s Killer of Sheep, from jazz to hip-hop, from the U.S. Civil Rights movement to Hurricane Katrina—to conjure a shareable world whose well being depends on the never-ending public conversation that is art. In Paris, she surprised many when she brought a group of local slam poets into the Louvre to highlight her belief in the power of unfettered (and sometimes disruptive) artistic expression to transform society. Referring to these poets, she observed that…young people's music is always despised and hated as corrupt, violent, sexual…. Mozart was despised as a kid when he was composing too many notes, too much, too fast. Jazz was the worst music you could hear. It was banned. Blues was banned. Rock music was banned. Young people's music is banned until it becomes the music of the land, and the same thing happened with hip-hop… But…despised as it is, young people's music…change[s] the language. And some people are afraid of that…. I was interested in un-policed language—language without the cops. Our film seeks to extend Morrison’s vision, honoring both its intellectual power and subversive artistic challenge. 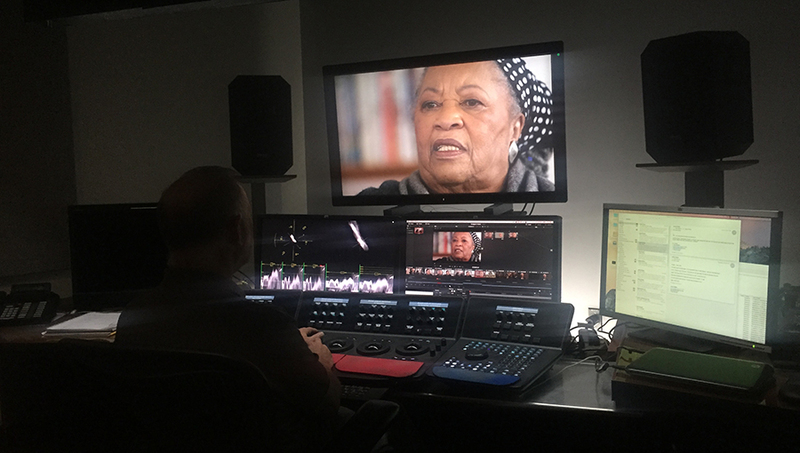 To do this we deploy a number of distinctive resources, including exclusive on-camera conversations between Toni Morrison and Haitian-American writer Edwidge Danticat in Morrison’s home in Grand-View, New York; digital video footage, shot by Ford Morrison on location at the Louvre in Paris in November 2006 in which Toni Morrison speaks with French and European radio and journalists as well as invited writers, choreographers, filmmakers, and musicians (William Forsythe, Charles Burnett, and French Slam poets, among others); original, hand-drawn, animation footage; archival still and motion pictures of critical topics and events in the American—and especially African-American—experience (from the blues to recent episodes of racial violence); and original musical and sound scores by Oberlin Conservatory of Music composers. Despite Morrison’s incalculable cultural and social influence, no non-fiction motion pictures exist that seriously engage her work and ideas. Our film, intended for a national and worldwide audience through festivals and public television, addresses this gap. Made with her full support, The Foreigner’s Home illuminates the ongoing human struggle for liberation, identity, and community to which she speaks in her larger body of writing and explores and reaffirms her conviction—expressed in “The Foreigner’s Home,” as in her writing and public speaking—that art has the power to ignite the kind of open exchange essential to the life of any genuine community.